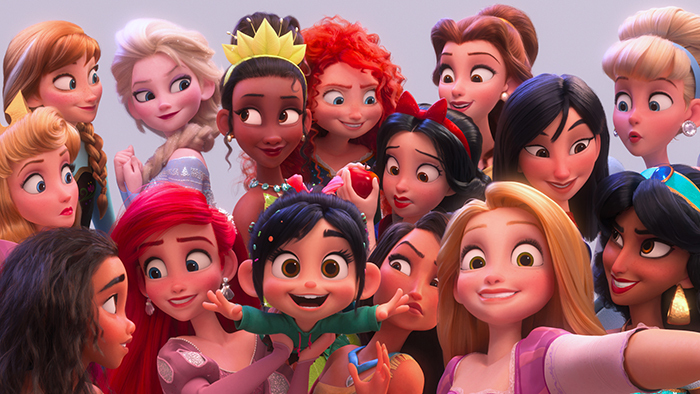 Ralph Breaks the Internet welcomes back to the big screen video-game bad guy Ralph and fellow misfit Vanellopevon Schweetz. This time, they leave Litwak’s video arcade behind, venturing into the uncharted, expansive and fast-paced world of the internet—which can be both incredibly exciting and overwhelming, depending on who you ask. The follow-up to 2012’s Wreck-It Ralph marks the first feature-length theatrical sequel from Walt Disney Animation Studios since 2000’s “Fantasia 2000,” which was a sequel to 1940’s Fantasia. The only other sequel in the Disney Animati on canon is 1990’s “The Rescuers Down Under.” “Ralph Breaks the Internet” is WDAS’ firstever sequel to be created by the original film’s writing/directing team. What is it about the characters of Ralph and Vanellope that called for an encore? When “Wreck-It Ralph” opened on Nov. 2, 2012, it turned in the highest opening weekend ever for a Walt Disney Animati on Studios film at the time. Producer Clark Spencer (“Zootopia,” “Wreck-It Ralph,” “Bolt,” “Lilo & Sti tch”) won the PGA Award for outstanding producer of an animated theatrical motion picture, and the fi lm won five Annie Awards, including best animated feature, director, screenplay and actor. It was also nominated for an Oscar and Golden Globe for best animated feature. Says Spencer, “I think people really responded to the fact that it didn’t sit within the typical Disney canon—people liked that we were pushing the boundaries and loved that we were going into a world that, though set in a retro arcade, felt completely modern for a Disney animated film.” After wrapping “Wreck-It Ralph,” Moore, Johnston and Spencer all switched gears, creating “Zootopia,” 2016’s Oscar-winning animated feature fi lm that introduced moviegoers to a vast modern mammal metropolis and its animal inhabitants. Moore helmed the fi lm with fellow director Byron Howard; Johnston was co-writer (with Jared Bush) and Spencer produced. Says Johnston, “‘Zootopia’ really showed us that you can push the tone and the emotional depth of a story pre???? y far with a family audience and it will resonate as long as it’s truthful. 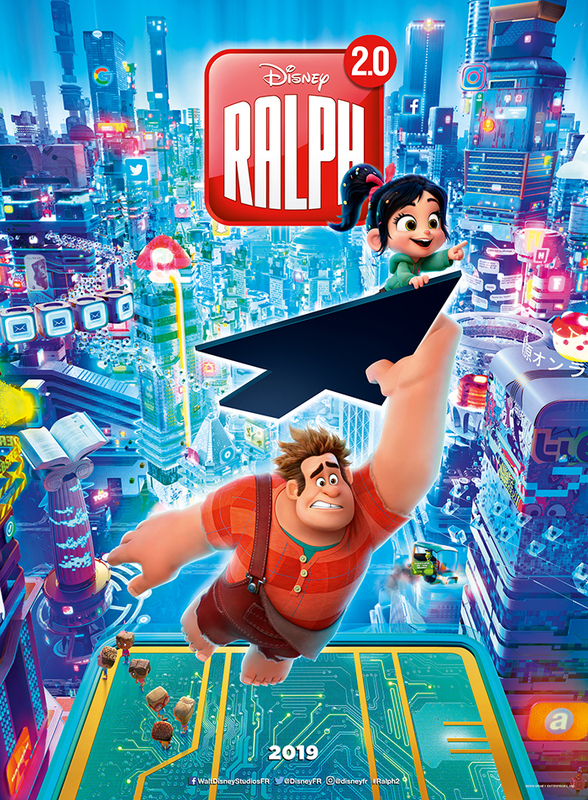 Directed by Moore and Johnston, and produced by Spencer, “Ralph Breaks the Internet” welcomes back favorite cast and characters introduced six years ago, including John C. Reilly, who provides the voice of Ralph, and Sarah Silverman, who returns as the voice of Vanellope. Lending a virtual hand to Ralph and Vanellope is Shank, voiced by Gal Gadot, a tough-as-nails driver from a gritty online auto-racing game called Slaughter Race, a place Vanellope wholeheartedly embraces—so much so that Ralph worries he may lose the only friend he’s ever had. Yesss, voiced by Taraji P. Henson, the head algorithm and the heart and soul of the trend-making site BuzzzTube, makes Ralph a viral sensati on. Jack McBrayer and Jane Lynch return as the voices of Fix-It Felix Jr. and Sergeant Calhoun, respecti vely, and Alan Tudyk was called on to voice a search engine named KnowsMore—literally a know-it-all—who runs a search bar and helps Ralph and Vanellope on their quest. The film features a screenplay by Phil Johnston and Pamela Ribon, and story by Moore, Johnston, Jim Reardon, Ribon and Josie Trinidad. The soundtrack includes original songs “Zero,” written and performed by Imagine Dragons; “A Place Called Slaughter Race,” performed by Silverman and Gadot with music by Disney Legend Alan Menken and lyrics by Johnston and Tom MacDougall, and a score by composer Henry Jackman. Julia Michaels performs a pop-version of “A Place Called Slaughter Race” called “In This Place,” which is the second end-credits song. I love that the film is about change says producer Clark Spencer. “Two best friends are about to realize that the world won’t always be the same. The internet is the perfect seeing, really, because it’s all about change—things change by the second.” The story kicks off in the arcade, where Ralph and Vanellope have been living harmoniously—fulfi lling their duties in their games during the day and hanging out together in their neighboring arcade games at night. “Vanellope is lamenting the fact that her game is getting a little boring,” says Johnston. “So, Ralph takes it upon himself to amplify the excitement in Sugar Rush. And Ralph being Ralph—it doesn’t go exactly as planned.” Ralph’s shenanigans trigger a chain of events that culminate with a player in the arcade accidentally breaking the steering wheel off Vanellope’s game. When Litwak learns that a replacement part would cost more than the game makes in a year, he has no choice but to unplug Sugar Rush and sell it for parts. “The part they need to fix the game is at a place on the internet called eBay,” says Pamela Ribon, who co-wrote the screenplay with Johnston. “Ralph and Vanellope have never heard of the internet, much less eBay, but Litwak has installed a router, so the arcade is actually online for the fi rst ti me. They decide to take the leap into this unknown world and travel to the internet in order to find the steering wheel and save Vanellope’s game. Ralph Breaks the Internet had its premiere in Los Angeles El Capitan Theatre few hours ago. The directors Phil Johnston (and screenwriter) and Rich Moore, the producer Clark Spencer, the screenwriter Pamela Ribon , the main casting voices John C Reilly, Sarah Silverman, Jack Mc Braye, Jane Lynch, Taraji P Henson, Alan Tudyk, Mandy Moore, the rock band Imagine Dragons and Aulii Cravalho, Jennifer Hale, Jennifer Lee, Jodi Benson, Kate Higgins, Ming Na Wenand, Linda Larkin, Paige OHara and Tom Mac Dougall were among the guests present to this World Premiere. Six years after the events of the first film, the steering wheel controller on the Sugar Rush game console breaks, forcing Mr. Litwak to unplug the machine. Wreck-It Ralph and Vanellope von Schweetz evacuate all of the Sugar Rush residents to other games before it is shut down, placing the racers in the care of Fix-It Felix Jr. and Sergeant Tamora Jean Calhoun. Ralph and Vanellope then use the arcade's new connection to the Internet to go looking for a replacement steering wheel. While they find a source for a replacement wheel, they need money, leading them to join a free-to-play violent racing game Slaughter Race where they meet Shank, one of the game's drivers. Vanellope is taken in by what Slaughter Race has to offer over Sugar Rush and Shank becomes a big sister figure for Vanellope, making Ralph concerned that Vanellope no longer looks up to him nor will return to her game. Along the way, the two encounter new customs, worlds, and characters, such as trendy algorithms and the Disney Princess lineup with The Muppets, Star Wars, Disney Animation, Marvel Comics and Pixar characters. Videos and photos: ©DISNEY. ALL RIGHTS RESERVED.